If Climate Isn’t Stable, Are We? In a short period of time (say, one or two hundred years), the human race has greatly grown in total numbers; has radically increased its per capita use of resources of every type; and has accelerated the rate of social change and scientific and technological advance. the time required for the implications of our success to sink in. In the climate-change debate, much has been made of this, by both sides. The Earth’s climate has at times over the past few billion years been at times much colder, and at other times much hotter, than it is today. 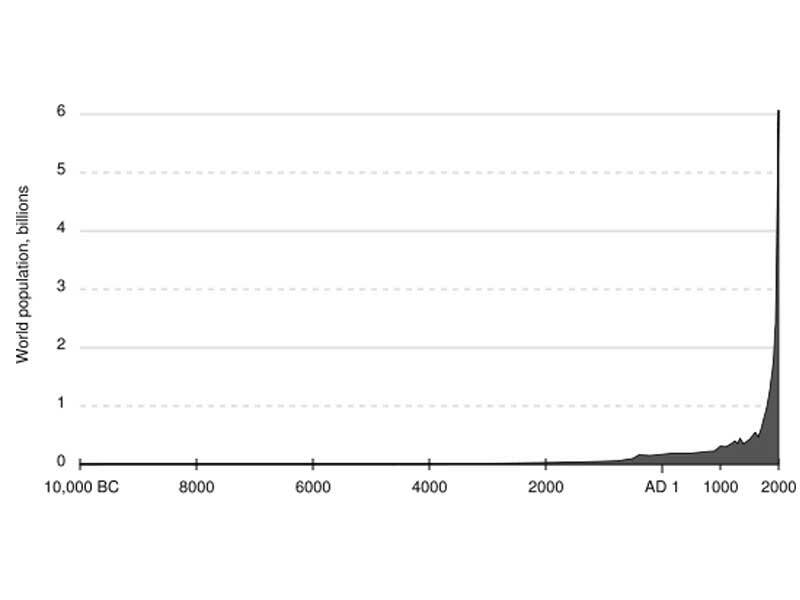 But during the last two hundred years, the time of this extraordinary human success, climate has been fairly stable. If climate hadn’t been so stable during this period, then we might not even have the word “climate” in our vocabulary. We wouldn’t think the concept was useful! And arguably, we might have been better off! Think a little bit about this. Suppose you’re in a job where you directly see the impact of weather on your labors. Such jobs are in the minority these days, but they matter – a lot. Take farming. To oversimplify: you want to base your decisions throughout the year on the weather – what to plant, when to plant, when to water, when to apply pesticides and fertilizers, when to harvest. But you have to make many of these decisions based on a time horizon much greater than any useful weather forecast. Meanwhile, over this same period of 200 years, while the human race has been on a roll, scientists have made some remarkable discoveries. They started looking hard at glaciers and the landscapes around them and discovered that ice, as much as a mile thick once covered much of the Earth, as recently as 10,000-20,000 years ago. Whoa! And they discovered looking back that at times the entire Earth must have felt tropical – that it was hot and steamy pretty much everywhere. Who knew? So the reality is that the Earth and its atmosphere and its weather are resolutely variable, on all time and space scales. From the standpoint of coping with climate variability and change of whatever cause, we might be better off simply asking questions like: how and in what ways are temperature and rainfall patterns, etc., likely to change over the next few hours? The next few days? The next few centuries? We’d be making no artificial distinctions between weather and climate (certainly nature doesn’t draw any such line of demarcation). Scientists are working hard on all this! The stakes of getting the right answers for the right reasons couldn’t be higher. In any event, for the past two hundred years, the climate has been remarkably stable. This narrow range of climate variability hasn’t challenged us so greatly. Humanity has been able to take the easy way out. We have tuned our decisions and actions in weather-sensitive sectors like agriculture, water resource management, energy-demand, transportation etc., to a rather narrow range of climatic variables. And we’ve been lucky! It’s worked so far. But we know from the science that climate is constantly changing, in part just because of the nature of the atmosphere and oceans, but in part because we’re tinkering. We’re taking all that carbon that plant life took out of that tropical atmosphere from millions of years ago and deposited into sediments – and we’re burning it and putting it back into the atmosphere. It’s looking like our winning streak is about to play out. This leads to a prediction: The future will be characterized by adverse climate shifts. We don’t know exactly how much, and we don’t know when. But we do know this. We won’t like them! We’ll view them as unfavorable. Why? How do we know they won’t be to our liking? Because we have tuned our climate sensitive activities – our human settlement and water use, our agriculture, our energy production and use, and many other aspects of our daily lives – to a narrow range of climate conditions. Note that this disaffection will be true whichever way the climate changes. When and where it gets wetter, we’re going to wish it were drier (I planted wheat instead of corn. I wish I’d planted corn!). Where it gets hotter, we’re going to wish it were cooler (ski season in Colorado is shorter than it used to be; I invested in my resort hotel at just the wrong time). Where it gets cooler, we’re going to wish it were warmer (Brr! My condominium heat pump here in Georgia isn’t up to this cold snap). When things dry up, we’ll long for the moisture (our hydroelectric power in the Pacific northwest is no longer meeting as much of our energy needs).